Hello guys and ladles, here's another new and interesting cheat to get more value of the data you buy from MTN. If you recall, this is the same cheat as the MTN 100% Double data bonus tagged as #KPALASA. It allows you get 100% data bonus when you buy a new smartphone and then purchase data from MTN using that same phone. But with the help of my trick, you can enjoy the offer without acquiring a new smartphone, all you need to do is to tweak some certain IMEI number to be eligible for the offer. 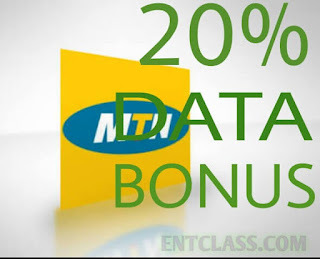 Back to the topic of this post, i will be teaching you a simple but technical tutorial on how to get 20% data value of the data you purchase from MTN. Officially, you automatically become eligible for the offer, only when you buy a certain new smartphone from Infinix or Tecno, you will automatically enjoy this bonus on your phone whenever you subscribe for data. But assuming you aren't getting this offer, you need to apply below tweaks. You have to Tweak your IMEI to activate the data bonus yourself. Don't worry, i will be taking you by hand as we do this. Just follow me along. ==> Tweak this IMEI: 351664085602496 (you can change the last 4 digits with any number of your choice) This is Tecno Y2 IMEI. ==> Use Imei analyzer to confirm if the imei is valid - Download Imei analyzer apk Here. ==> To tweak IMEI of an MTK phone like Infinix, Tecno, Gionee, iTel, click here for guide. ==> After tweaking, simply switch ON and OFF airplane mode and dial *#06# to confirm that the new IMEI has been saved. Congratulations! Your smartphone has been activated to enjoy 20% bonus on any data you buy for the next 3months. DIAL *131*1# to buy your preferred data plan. (If the IMEI has been used, you won't get any response from MTN, all you have to do is to tweak again until you are successful). Henceforth, anytime you subscribe for a data plan by dialing *131*1# you will get free 20% bonus for the next 3months. After these 3 months has elapsed, you have to tweak the imei again to be eligible for the next 3 months again. That's how it goes. For example: If you purchase 3.5GB for N2,000 monthly data from MTN, you will be given free 20% data bonus, which is 700MB. That's how it works. To check your data balance by dialing *559# or sms 2 to 131. For me, i still prefer my 100% data bonus cheat. Can you believe i was the first person to bring out this idea and also the first to share it on this blog? I've been enjoying this value for money data since MTN launched this offer late last year 2016, even now, I'm still using it. That's exactly what I'm using to write this post now. If 100% data bonus didn't work for you, I'm sure this alternative of 20% data bonus should at least work for you. If you have any problem regarding MTN 100% data bonus, including 20% data bonus, kindly comment below, and I will guide you on what to do. Please and please, don't just read and walk away, kindly Share this post for others to read. MTN 20% data bonus cheat. MTN Imei data bonus cheat. Mtn free MB cheat code 2017. Latest IMEI for MTN 20% data bonus cheat for 2017. Have you used Shortcode master app? If you just activated the 100% data bonus, you will keep getting 100% data bonus whenever you buy data from MTN till the next 6 months. When the 6months are over, you need to tweak the particular Imei again to be eligible for another 6 months. Bro kachi.. The mtk stuff ain't working.. Saeing engineering mode not found..
Nice but 100% or nothing. S.K, sorry i mistakenly deleted your comment, kindly re-comment again. It's necessary to use Imei analyzer to confirm that the imei is valid. I can't tweak my infinix nite 3 imei, the error is your device doesn't support mtk chipset. Where did you get that error from?